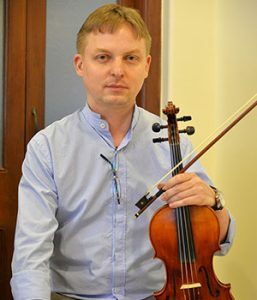 Keenly interested in the Viola, Artem graduated from the Specialised Music School and Music College in Vladimir, Russia in 1996, and progressed to the Tchaikovsky Moscow State Conservatory, completing a post-graduate course in music by 2003. Since 1996, Artem has performed with a wide range of orchestras and chamber ensembles in Russia, South Korea, China and Greece. He also taught the Viola at the Bach School in South Korea. He joined the Symphony Orchestra of India in 2008 and also taught the Viola at the NCPA music training programme from 2012. Artem joined the Instrument Faculty of MMMF in July 2016.